Everything was terrific. The wifi was a little less than reliable at times...we were usually getting bumped off and had to reconnect. If our visit was depending on wifi it might have been problematic. But otherwise, really great place. 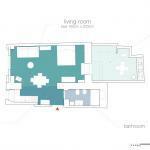 Very nice apartment, amazing location, close to all Rome's best spots. Everythnig perfect with RomeLoft, thanks! 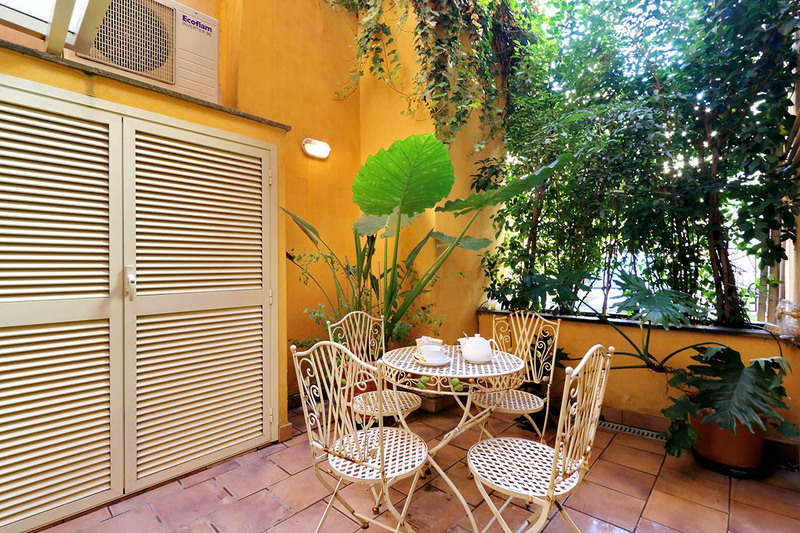 Located on the ground floor, it features a lovely courtyard with nice plants, as well as an elegant open space. This could be lovely in the mornings, enjoying an invigorating coffee before heading out to explore the city. The open space has a living area, with a comfortable sofa bed, and a dining area with an original iron table and chairs. This is the ideal place to unwind in the comfort of a private and quiet space after a long day of exploring. 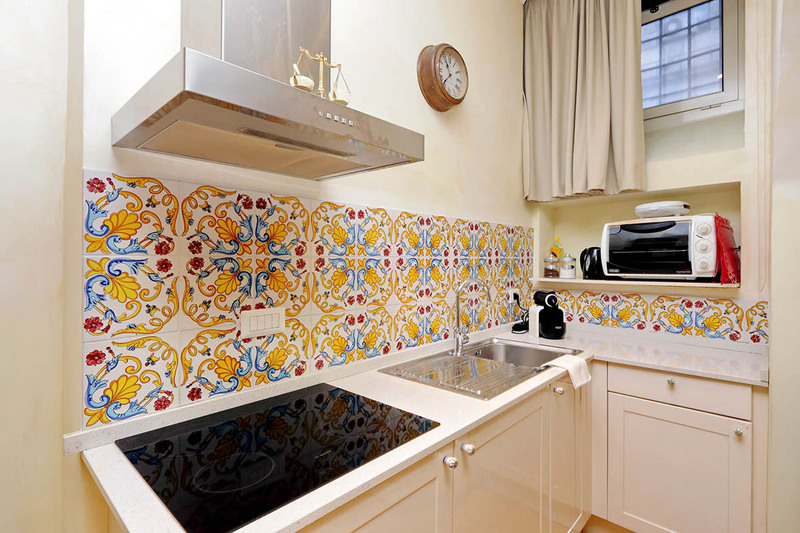 You will also find a well equipped bright kitchenette, with an electric stove, a fridge, and a freezer. As such, this is a great space in which to prepare your breakfast and lunch, or even cook a fuss-free meal in the evenings, should you wish to stay within your own home. Through the open-spaced room within the same space, you’ll also find a stylish king size bed and a large wooden wardrobe. In this unit, you’ll notice the great attention to detail. All the amenities have been chosen carefully: air conditioning, central heating and wireless Internet access will make your stay a comfortable one. 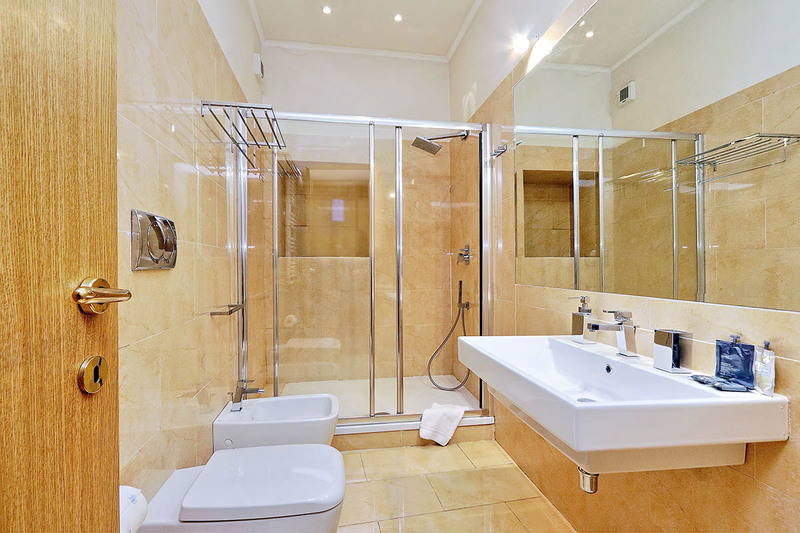 The bathroom is completely new: it features a very large shower. You’ll also find a hair dryer against the wall. 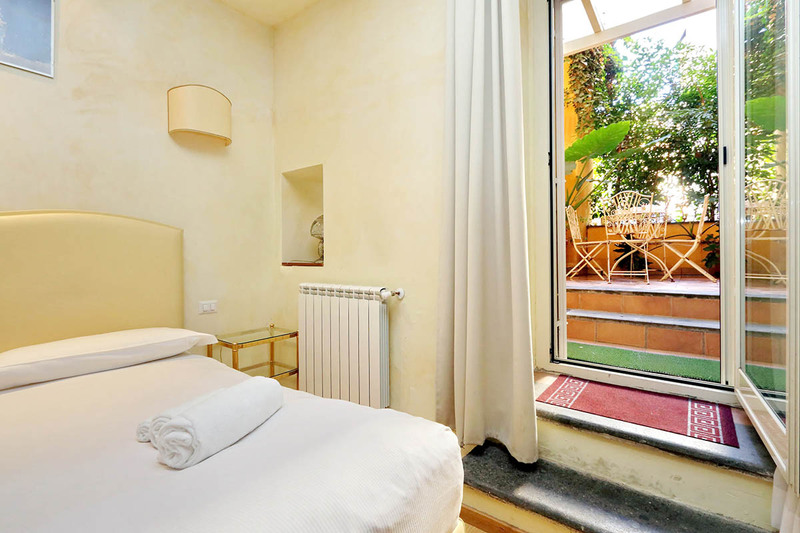 The best features of this nice Rome studio apartment are its central location and its outside space where you can enjoy the mild Roman weather from home! 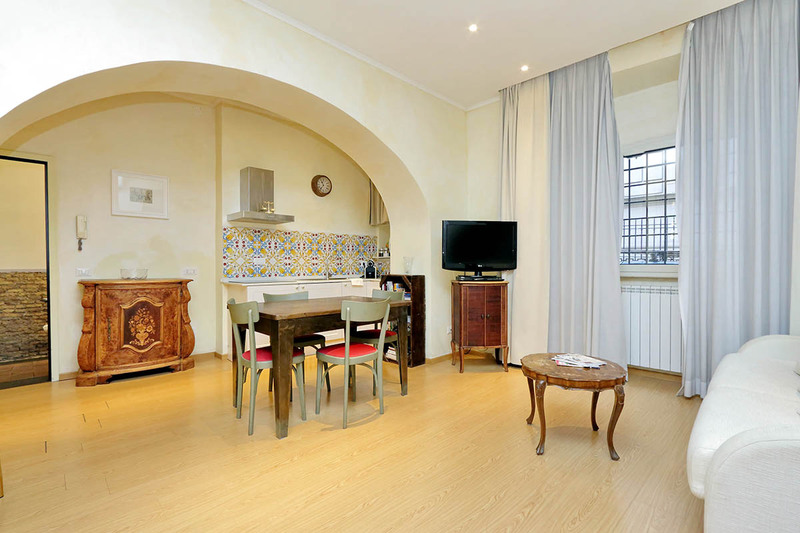 This apartment lies in a truly great position to go and explore the rest of the historical center. It sits between two of the liveliest areas in the city come evening. Here you will find an innumerable amount of restaurants and bars serving traditional Roman cuisine, aperitivo, wines, cocktails, and beers. The atmosphere is warm and friendly, and filled with a youthful energy. During the day, you can access many of the main attractions on foot. 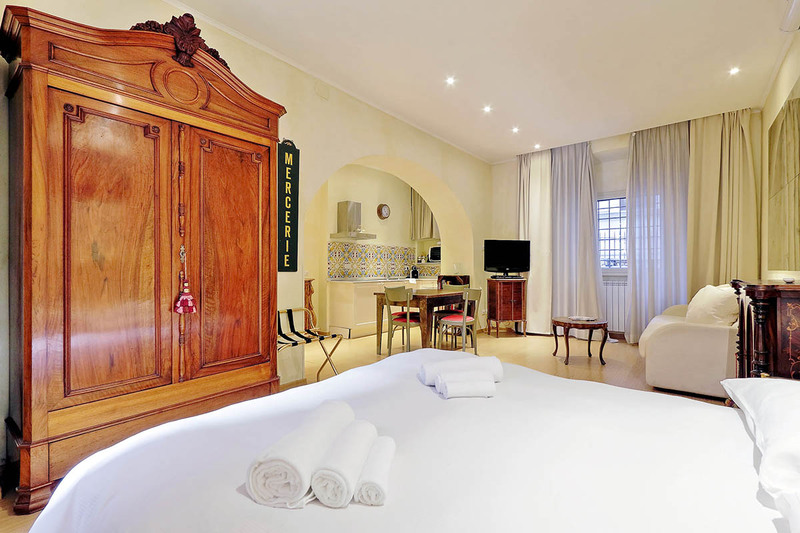 Within a few minutes you can arrive at the Castel Sant’Angelo, Piazza Navona, Pantheon, and Trevi Fountain. We highly recommend waiting until after dark to see the Trevi Fountain. The night-time illuminations add something truly magical to the fountain and the later you wait, the fewer people you will have to compete with for the perfect photo! 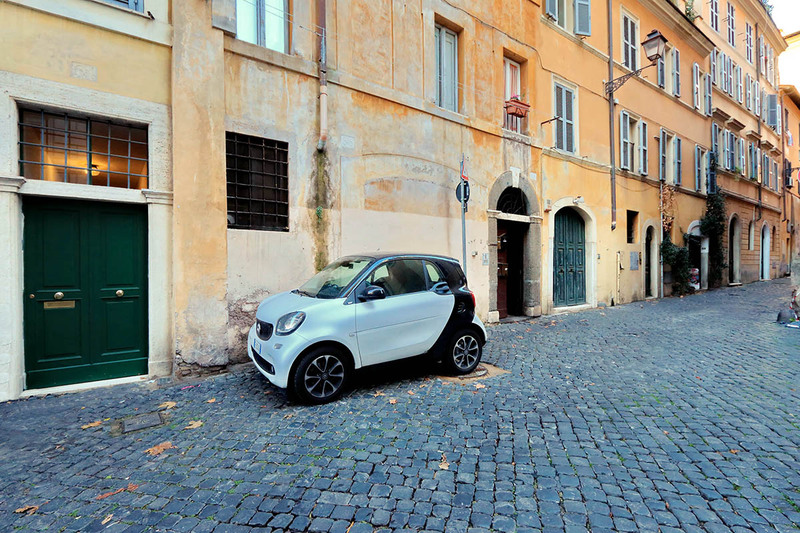 Just a little further will take you to the Piazza Venezia, the Spanish Steps, and the Piazza del Popolo. Behind the latter you will also find the Villa Borghese park. This is a stunning oasis of green amidst the city center. 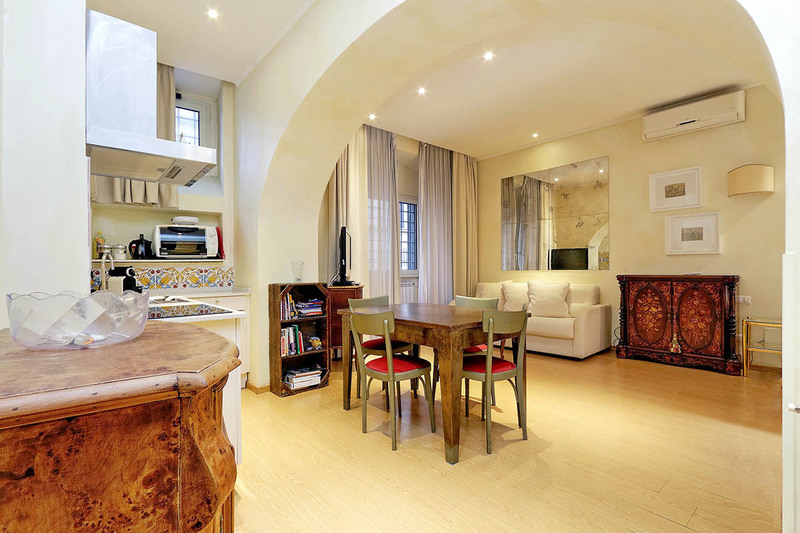 It moreover offers sweeping views over the city from its Pincio Terrace. This is great apartment with the perfect location, no doubt! The apartment has everything you need. Not luxosrious but great. The only thing compared to a hotel is lack of hotel services as breakfast and staff at a desk - but if you rather make it on your own this is the choice. Coffee machine and small kitchen in the room. Groceries for breakfast ...Read Moreetc just a minute walk away. 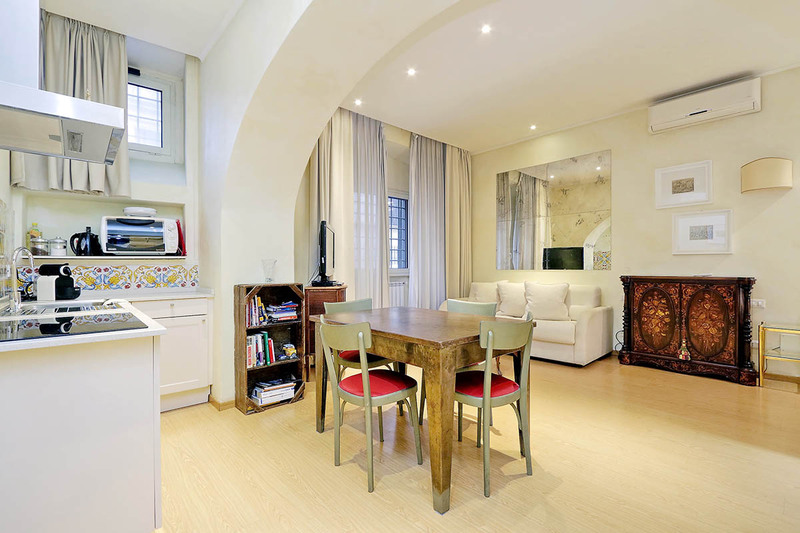 Undoubtedly the best thing about this apartment is that it is in the heart of the old city yet very, very quiet. 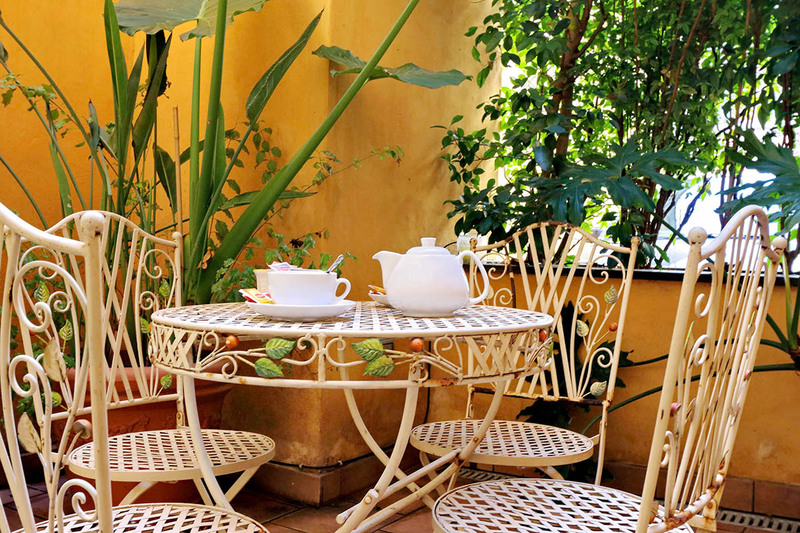 It is in a small street midway between the Campo de' Fiori and Trastevere. There is very little through traffic and it is very quiet at night, as it is opposite a government building rather than a nightclub. I was travelling for ...Read Morework and had no need for a great view, proximity to the big name shops etc, so the apartment was just right for me. 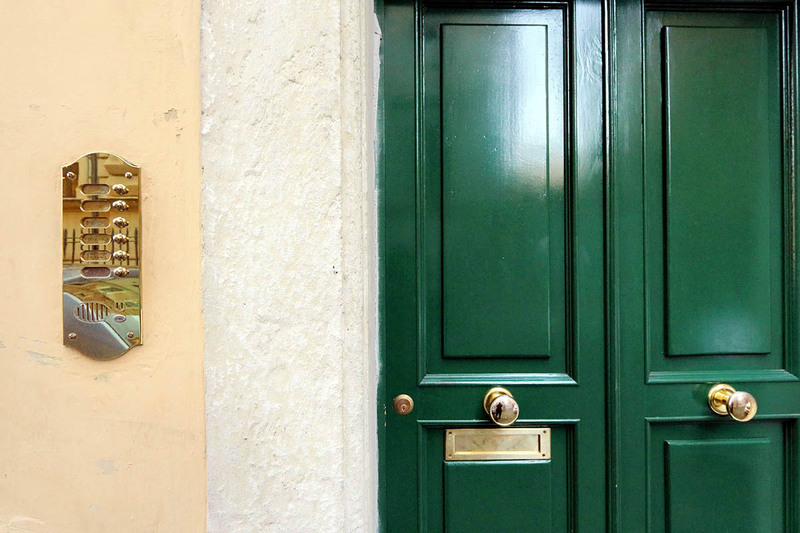 If you are a first time visitor and are looking for the 'classic experience' - the Spanish Steps, the Versace boutiques and the well-known cafes, then you might find the location a little obscure. If you are a history/art buff and a return visitor, you will appreciate the location more. I have visited Rome for a few weeks each year for the last 20 years, so I tend to be seeking more out of the way experiences. The service from RomeLoft was exemplary, and much better than I have eperienced from similar apartment rental companies (the forerunners of airbnb). I received a phone call when I was off the plane and there was a person waiting for me at the door with the keys when I arrived. 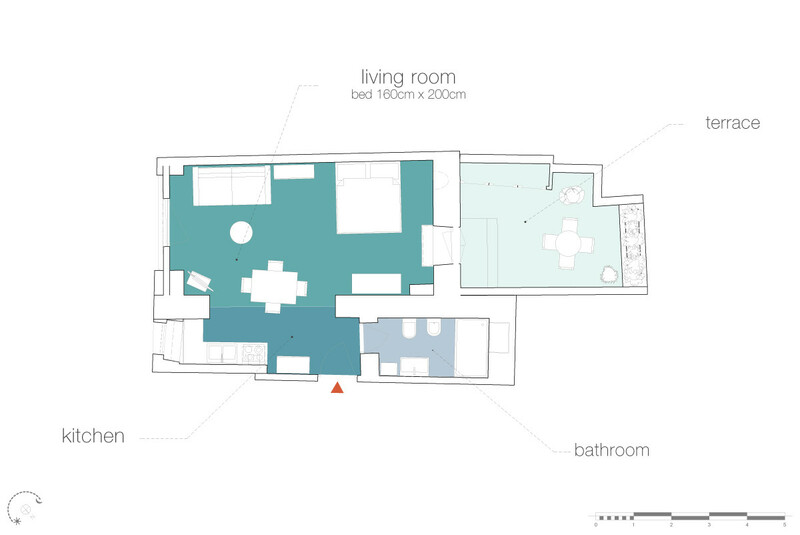 On the downside, the apartment is on the ground floor and doesn't get a huge amount of natural light. There i a small terrace with a view over... a car park. The apartment needs a fresh coat of paint and the bed is, er, firm! Having said that, everything works, the kitchenette is practical and the bathrooms is good. I loved the studio. At the beginning I had a little problem dealing with the eletric stove, but this was solved. I missed a microwave oven. The bathroom was awesome. Confortable bed. If life allows I'll come back to Rome and stay there again. What put me off was the fine of 25 euro for a delay of 30 minutes. This was too strict. It's idea...Read Morel for two people, for the sofa is not so confortable for a third to sleep in. We thoroughly enjoyed our 3-day stay in Rome! The apartment was lovely, clean, and comfortable, with an outdoor balcony and a large shower, right near the Jewish Ghetto and within walking distance to all the major tourist sites. Mr. Honey was very accomodating and evne took care of ordering car service to take us to the airport. 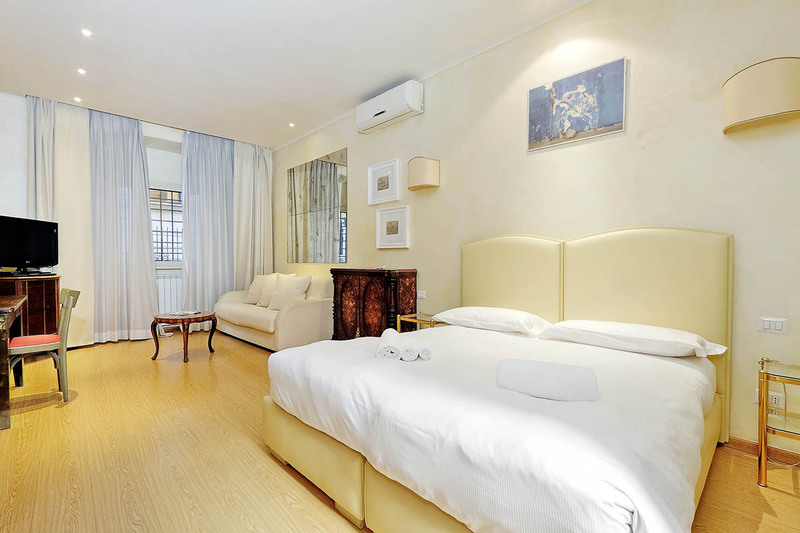 We'd definitel...Read Morey choose a Romeloft apartment again on our next visit. 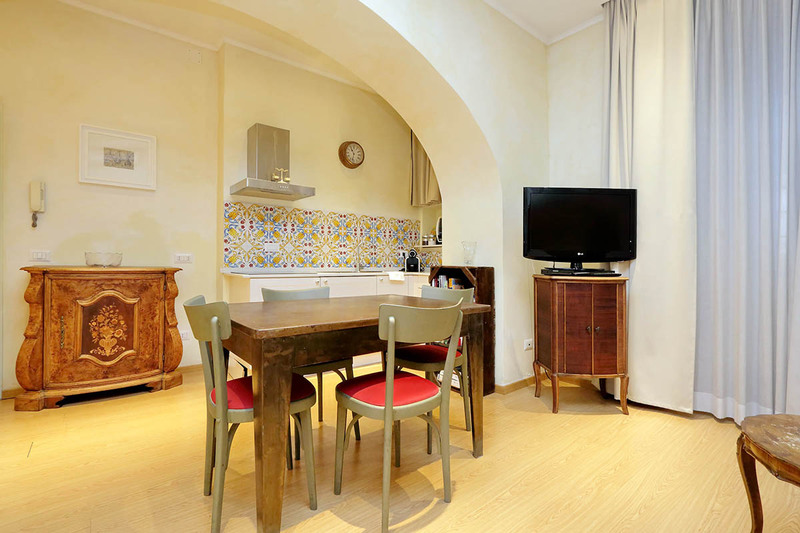 The apartment at Via del Conservatorio,64 was ideal for our first visit to Rome. Perfect for a couple, although the bed was about the hardest we have ever slept on ! Nice & clean on arrival, and we were met, as arranged at the flat by Honey, who explained how everything worked, and where the nearest Supermarket was etc. Good modern bathroom wit...Read Moreh large shower, and fitted hairdryer right next to the mirror (how often do you find that ?). Kitchen facilities were adequate for breakfast, which was all we wanted. 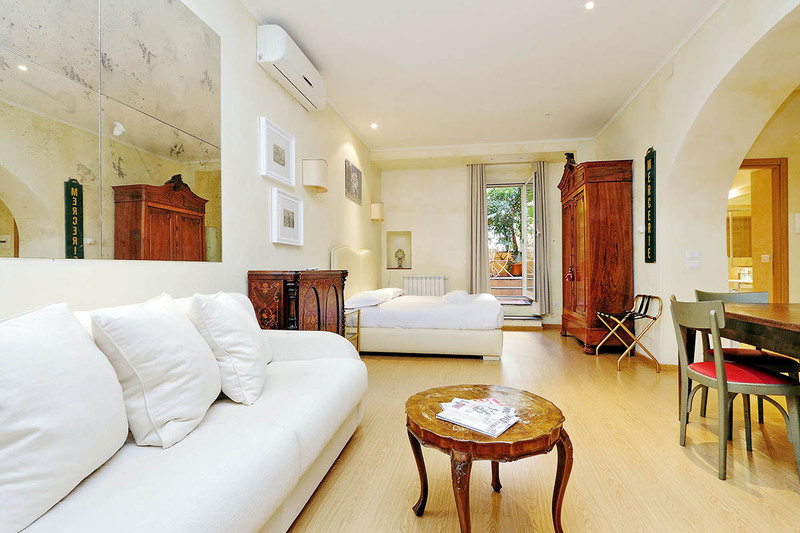 The situation of the apartment is perfect for walking to the major sights, and shops. Lots of eating out choices around the nearby Campo de Fiori. The best meal we had was at Ditirambo, Piazza delia Cancelleria, 74, just off the top left corner of the Campo.The other restaurant we would recommend near the Pantheon, was Settimio Al Pantheon, Via delle Colonelle, 14. Excellent Game menu there. If you want a guided tour, we would recommend Dark Rome Tours & Walks. The 3 hour semi-private tour of the Vatican Museums and Sistine Chapel was excellent. The guide was very knowledgeable. 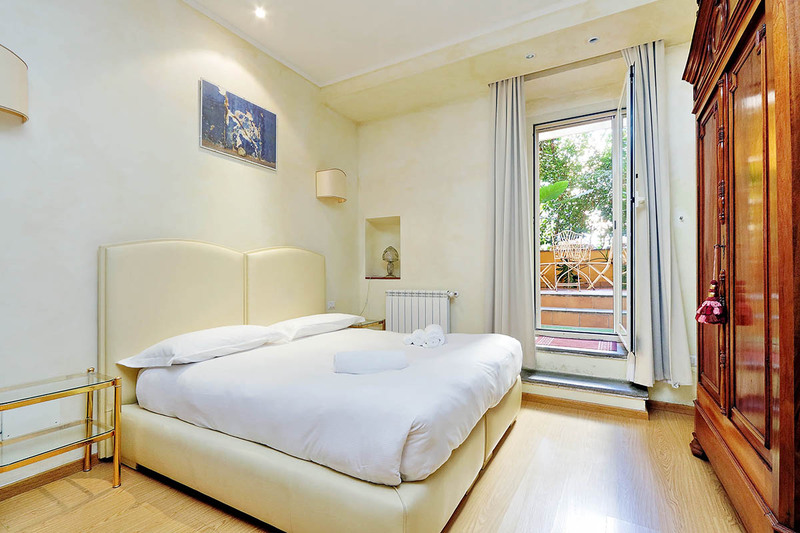 We hope to visit again to see more of Rome, and would certainly consider using Romeloft again. 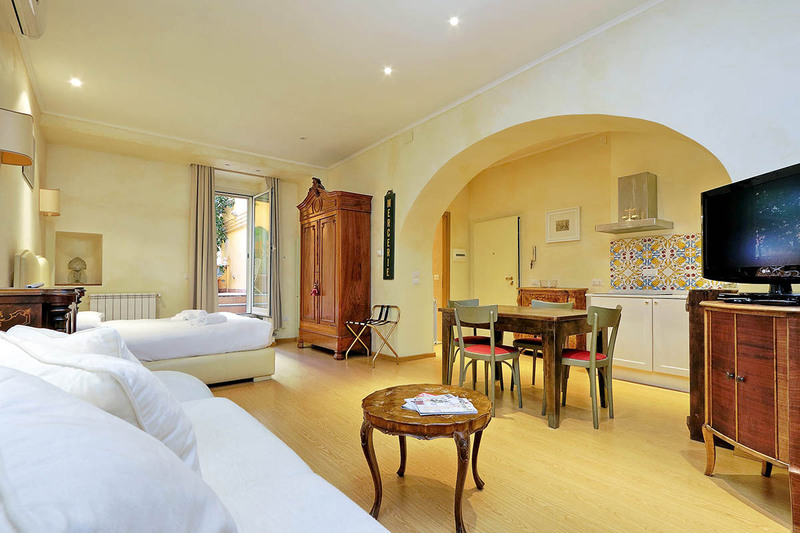 One of the main difficulties while preparing our trip to Rome, was to decide where to stay. Some of the good fare hotels were not so well located, those in the center look old or too expensive, ... so after some recomendations from friends that have been in Rome before, we decided to look for an appartmet. Rome loft was not the first place we visit...Read Moreed but was the best one in information, easy to find, photos, locations, etc, etc. 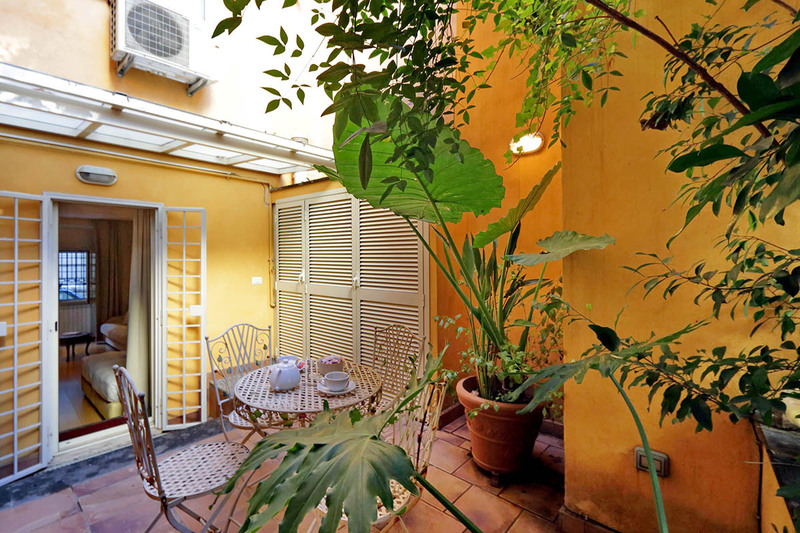 And we finally decided for this studio, even in the ground floor, with a nice terrace inside and in a very quiet street and close to everything in Rome. Even restaurants in the streets around it, were a very good choice. It made our visit to Rome at around 37ºC more pleasant as it was possible to go to our appart. easily to relax for a while. Una bona manera de visitar Roma sota una onada de calor, molt centric i acollidor tal i com surt a les fotos!! !